This anklet fits most styles. It can be matched with various dressing styles. You can wear it in any occasions and it makes you eye catching. All pictures are taken from actual products. Service: Xiaodou Jewelry store for more latest jewelry sets in various styles. Extension Chain, the extension chain allows the wearer to adjust the anklet for a perfect fit. 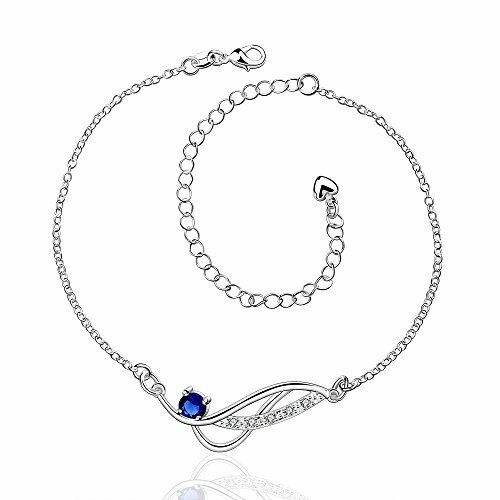 Elegant sterling silver blue anklet that features a simple but adorable design. A round created sapphire blue rhinestone is encircled with crystals creating a stunning design. Ideal for brides and their something blue or for a gift on a special occasion. If you have any questions about this product by Xiaodou, contact us by completing and submitting the form below. If you are looking for a specif part number, please include it with your message.